Helpful commenter MegaZone posted his notes here and Thomas Hawk posted a review of the call on his site. TiVo To Go is coming by the end of the year. That's great to hear and backs up beta tester info I've gotten recently. It's almost ready for prime time and will definitely come out in the next four weeks. My secret hope is TiVo drops the news tomorrow, to help spur on more holiday sales of the units, especially this big shopping Friday following Thanksgiving. They're hot on the DVD burning TiVo. TiVo sold a bunch and feel it's different than anything else in the marketplace. While that sounds great for them, I'm not sure if it's a good long term solution for increased sales. 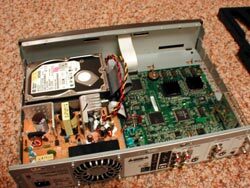 I've always imagined my TiVo like a computer, which gets upgraded every two years, but I think of my DVD player as an object that only gets replaced when it breaks. When we're up to series 4 tivos that can levitate, the humax might not be looking so hot. Still, not many people have DVD burners, so maybe that's a great point at which to combine with TiVo and let them kill two birds with one stone. They talked about a standalone HD Tivo. They liked that DirecTV couldn't keep the HD DirecTiVos on the shelves this year, despite the high price, and are thinking of releasing a standalone unit. Of course, not many people will be hip to it if it only records OTA signals, so they'll have to get the cablecard stuff working for Comcast customers. Other stuff. They talked about delivering content via broadband, like the Netflix deal, since 80% of their userbase has broadband. I see mentions of the move towards advertising revenue, but not nearly as much as in the CEO's talk a couple weeks ago. In the previous stage of the upgrade process I covered how to prepare a new 120Gb drive for a series 2 TiVo. I purposely left out the steps where you install the drive back into the TiVo, saving that process for this review. The first TiVo I upgraded last year was a Directv comibnation tivo/satellite receiver, and it was designed to handle two hard drives (but shipped with one). Adding a drive to that machine was no problem, since it was already pre-drilled for the drive and there was even spare IDE cables and power connectors available. The series 1 and series 2 standalone TiVos require a special bracket however, making things a bit trickier (I don't know if series 2 directivos have the bracket for a second drive still). I decided up front to buy a 40Gb TiVo knowing that I could upgrade it myself cheaper than what TiVo sold the 80Gb model for (an extra $100). To start off, I browsed the forums looking for tips and found that adding an additional 120Gb drive would be pretty cheap and be pretty painless. After reading a lot of forum posts, it seemed clear that most people say you should get a 5400rpm upgrade drive, because the extra speed of a 7200rpm drive isn't really necessary in a TiVo, and only contributes more noise and heat to the machine. While shopping around for cheap 120Gb drives online, I couldn't find anything in a slower 5400rpm setup so I just decided to go with a 7200rpm drive from Maxtor. This is a shot from the output of my newly upgraded series 2 Tivo (project described here), after I added a new hard drive tonight. All told, it took a couple hours and I took many photos along the way and wrote a lot of notes, which I need to organize and clean up before posting the full report here. For now, my work is done and I'm off to set a few dozen new season passes. 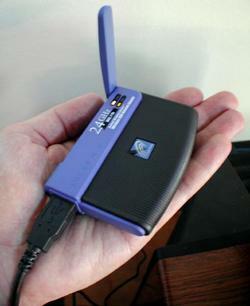 The Linksys WUSB11 is TiVo's suggested usb-to-802.11b adapter for the new series 2 TiVos. The TiVo store offers it for $64.95, though I got mine at Amazon for $49 with an additional $10 rebate. My first thought was how amazingly small the unit was. I suppose it's basically just a PCI card combined with some usb circuitry, but from the pictures on the Amazon site, I assumed it was the size of a desktop PC. The photo to the right is the unit in the palm of my hand. The signal strength was great, though my base station is only about 30 feet from the TiVo, with no obstructions (second story loft down to the first floor). It doesn't require a power adapter which is great (my outlets are already crowded with gadgets), drawing power from the usb connection. It plugged in, grabbed an IP, and has worked fine ever since. I think it's going to be one of those set-it-and-forget-it kinds of products (the kind I love — they don't require futzing around every so often). The biggest and only drawback to this in regards to a TiVo is that you must have the 4.0 TiVo OS in order to use it (which requires a Series 2 box as well — Series 1 owners can use a slightly more hacky TiVo Airnet from 9thTee). If not, you'll run into the problem I had, where you'll have to use a phone-line (or usb-to-ethernet if you have the 3.2 OS) to force an update to the latest OS before it will function. Once the setup was complete, the unit has worked flawlessly, it's small, fairly cheap (40 bucks after rebates), and I'll be getting updates every 30 minutes or so from TiVo, all without ever needing a phone line again. Since I moved recently, I went with a Vonage phone that works with my cable modem instead of opting for a standard landline from the local teleco. I knew going in that Vonage clearly states: "We do not currently support DirecTV and TiVo." So instead, I checked around the TiVo Community and noticed a lot of people happy with their Linksys wusb11 wireless adapter. The problem I found tonight is one of the first steps in the guided setup requires a call to TiVo. All the TiVo docs about getting your machine on a LAN present screens from a fully functioning Tivo, and there didn't seem to be a way around it in the setup. I decided to call customer service and get the secret backdoor to skipping the call. The customer service phone number listed on the TiVo site has turned into what my friend Merlin dubs "phone jail". You can't hit buttons, skip to a live person, or otherwise get around a slow talking robot that requires you to speak in order to issue commands. Eventually when the robot couldn't help me they gave out the real customer service number: (505) 348-2800. After talking to a human it was revealed that you can't setup a brand-new tivo without a landline. The reason he said, was that TiVo doesn't ship all new units with the 4.0 OS, and without it, LAN connectivity doesn't function. He said that hopefully in the next six months, setups without phonelines would be possible, but currently it was not. As much as I love TiVo, their website has been giving me fits. The first problem I encountered was ordering it. Despite entering in my contact information exactly like it was on my bank statements, the site refused to sell me one and kept giving me invalid home address errors. I spent an hour on the phone with their customer service, only to be told they got the same errors when they tried it. My bank meanwhile was giving approval codes and I got a call from them asking me if I really authorized the purchase of 10 TiVos. The problem was never resolved and I ended up ordering it after a recent move and update of my address with the bank. Tonight I tried to activate the new series2 project TiVo, but I encountered error after error. I repeated my entries several times, attempting to figure it out. It appears at least for me, that I can't activate a TiVo and also order the Home Media Option or change the system name of my TiVo, even though those are options on the signup page. Worse yet, I get an unhelpful error (in red text, it says error, try back again later and then there is a long string of ascii that appears to be a hash of some sort). By skipping the Home Media $99 and keeping my cryptic name, I got through, though I guess I'll try to adding the Home Media option later. 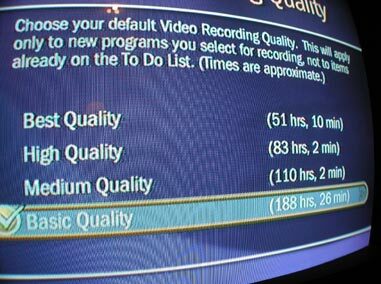 TiVo, I want to give you my money, if you'd just let me do it. This will yeild a 160hr TiVo for about the suggested retail cost of a 80Gb TiVo. 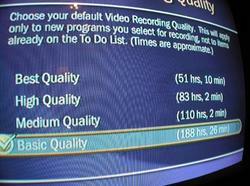 It will be quieter than a standard TiVo, use less power, and look better in the process. Using the deal mentioned in the previous post, I've just gotten my hands on a $199 bone stock 40Gb Series 2 TiVo, model number TCD24004A. This machine will the be basis for an ongoing project outlined here in text and images, tentitively called the SuperTiVo Project. I'll be upgrading just about every aspect of the machine, and along the way I'll post how-to articles about installations and configurations, and reviews of products used in the box. I'll be starting with adding the TiVo to a wireless home network, then adding a 120Gb hard drive will take place. After that, internal upgrades (new fans and wiring) will be done. I'm planning to install packages such as tivoweb, and hopefully I'll be publishing information from this TiVo directly on this site.